In the months of September to October the nature in Denmark is packed with many delicious fruits and berries, like apples, pears, elderberries, blueberries, raspberries and so on. This is not just Denmark, in the most of the world these kinds of fruits are picked at this time a year. We always take advantages of this great opportunity to make some delicious food from all these fresh ingredients. We personally think it is a lot of fun to pick our own berries, and then we also have the opportunity to get the best quality ones. Picking your own fruit and berries is also something the kids tend to find funny. Therefore, it is a great opportunity for parents to teach kids about the forest, and the nature in general, and then later teach how to cook delicious food by ingredients found in it. That is a nice way to spend your Saturday! If you don’t have the opportunities to pick these fruits in the nature by yourself it is possible to buy already picked berries from your local farmers’ market/greengrocers. The great thing about the wild berries is that they are normally not sprayed with any pesticides or other bad stuff. When that said, always pick those berries that aren’t close to busy road or other polluting things. Remember to wash and clean the berries thoroughly. 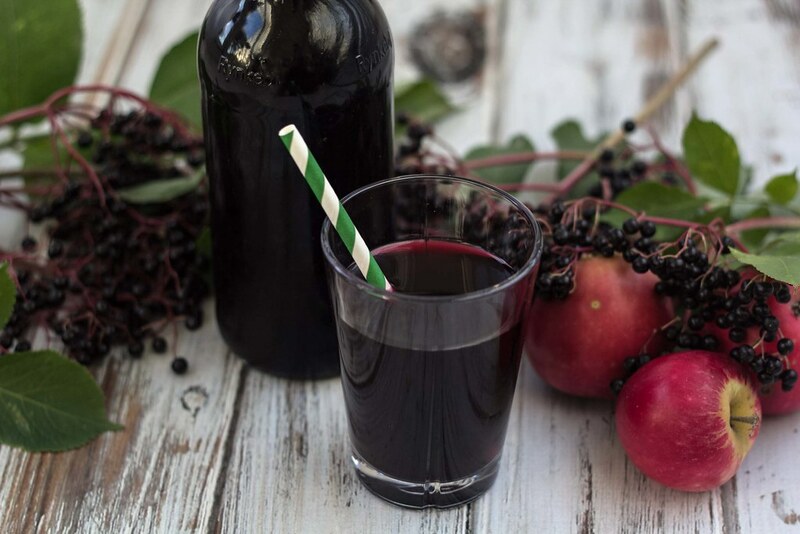 This recipe for elderberry juice is easy to make and it has a super delicious taste. The concentrated juice can be mixed with cold water in the ratio 1/3 and a couple of ice cubes. However, the juice can also be drink hot maybe with some rum – some people say that should keep the cold away. In general the elderberries are said to be very healthy and that they contain many good vitamins, and that is just a bonus to the great taste. You can serve this cold drink together with a piece of this delicious chocolate cake or some homemade chocolate chip cookies. Step 1: Wash and clean the elderberries thoroughly. Cut off and remove most of the branches and twigs. You can leave on the smallest ones. Step 2: Wash the apples and remove the core. Slice them. Step 3: Put the elderberries and the apples in a large sauce pan and pour on all the water. Let the boil for about 30 minutes or until all the berries are drained from juice. Step 4: Put a clean tea towel or similar inside a strainer. Place the strainer on top of another large sauce pan or bowl. 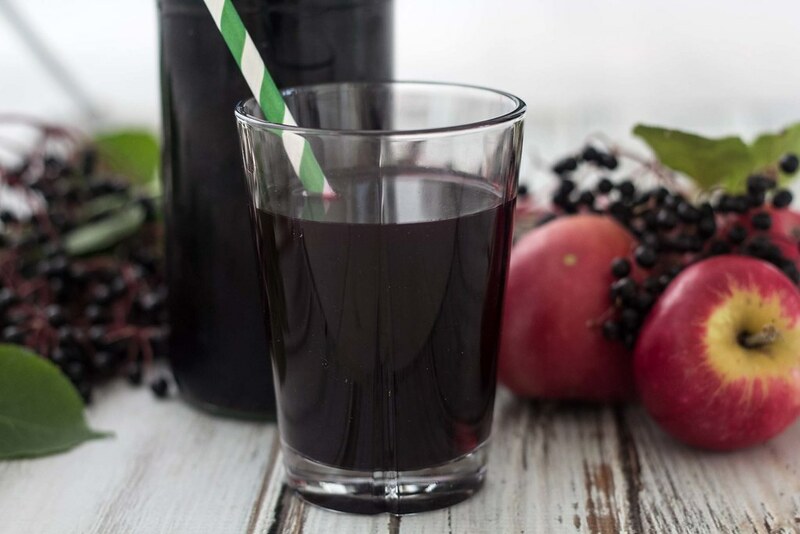 Pour the elderberries juice in the strainer and use a spoon to press the berries so that you get all the juice out of them. Let it stand and drip all the juice through the tea towel and strainer. Step 5: At medium heat, heat up the concentrated juice in a sauce pan and add the sugar. Continue heating and stirring until all the sugar is dissolved. Step 6: Clean some bottles in very hot water (preferred boiling water), and let them cool off. Pour the concentrated elderberry juice on to the bottles and close/seal them right after. This step is important if you want to make the juice last longer. Step 7: Keep the juice refrigerated. You should be able to store it for quite some time. We believe when you have opened a bottle it will only last for a couple of weeks. The bottles should be heated in the oven @90degrees. If you pour the hot juice into cool bottles they will burst. The bottles should also stand on a damp cloth when filling and should stay there until cool! Rather than can the juice, is there any reason I can’t freeze it? Of course you can freeze it. Is there a reason you discard the mashed boiled elderberry fruit instead of leaving it in the concoction? Especially if you’ve boiled it thoroughly? Perhaps it is more immunogenic even if Lumpy. I don’t care if the concoction is lumpier if it would be better for me and my family . I am not the only one with this question because I’ve seen it asked on many websites and have not seen this question answered. Hi. That is a good question! The only reason why I discard the mashed elderberry is to have a clean juice. I can’t see the problem in keeping this pulp in the juice. After all, it should only give more flavor to the juice. 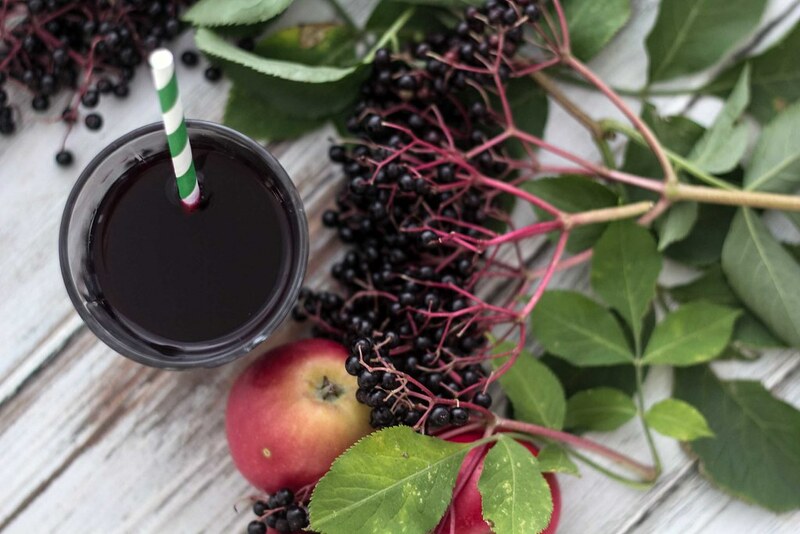 I purchased elderberry concentrate, can and how do I make juice? I’m not sure about the concentration. But I would just use the concentrate instead of the 2,5 kg berries. I am jacqueline and write Deeprootsathome.com and in the process of doing another elderberry post for this winter. 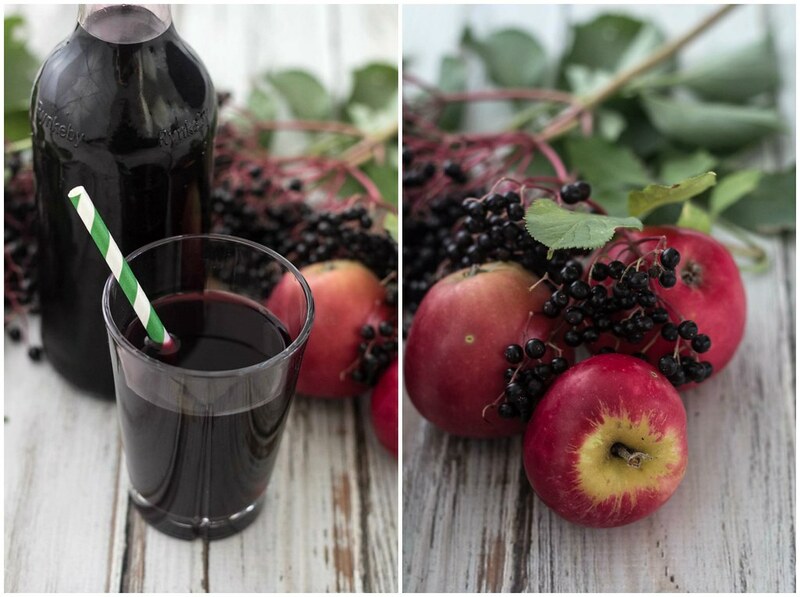 I would like to ask permission to use 2 photos from your elderberry juice post. I am thinking about the second from the top and the bottom, split photo, and I I will give you photo credit on both. Beautiful photography! If it is good with you, please let me know by email. And thank you for your time and consideration!